DesktopTwo is a powerful new web based computing service that offers an impressive list of well designed features, all for free. Created by a New York and Toluca, Mexico based company called Sapotek, DesktopTwo is an enhanced version in English of Sapotek’s Computadora.de service. Their Spanish service already has 100,000 subscribers. This service is something truly useful. If you like Web based IM, why stop there? A WebOS isn’t a new idea, but this one looks like a solid offering. 1 GB of free storage. 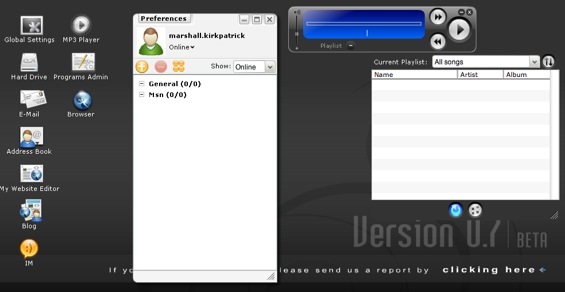 An inline MP3 player with playlist creation. A blog publishing platform with support for tags, full or partial RSS feeds, 16 layout templates and the ability to edit the CSS. The company’s business model will be based on selling storage beyond the 1GB that comes for free and selling subscriptions to a forthcoming enterprise version of the service. Sapotek says their company is based on the belief that IT should be a commodity, accessible to all regardless of socioeconomic circumstances. In DesktopTwo, they have made a great move in that direction. I think many of our readers will find this to be a valuable resource.